Following previous Mac-supported displays that boasted USB-C and some Thunderbolt 3 compatibility, LG today announced a new set of monitors that all include full Thunderbolt 3 support. The news comes ahead of CES 2018, where LG will officially introduce the three new upgraded models of its popular monitor lineup. Apple and LG originally teamed up to create 4K and 5K UltraFine Displays aimed at the late 2016 MacBook Pro models. The first monitor is a 32-inch UHD 4K model (named LG 32UK950) and offers LG's advanced Nano IPS technology, which the company said will enhance the "intensity and purity" of on-screen colors so that viewing experiences are more life-like. This monitor can display 98 percent of the DCI-P3 color spectrum and supports HDR 600, all making it comparable to monitors used to master Hollywood films, according to LG. LG 32UK950 also features a Thunderbolt 3 docking display so that it can be daisy chained and be part of a dual 4K monitor setup. It can connect to Apple computers like MacBook Pro through a Thunderbolt 3 cable, transmitting 4K content, sound, and fueling up the connected MacBook (with enough charge to power a 60W notebook). The second monitor is the LG 34WK95U, a 34-inch UltraWide monitor with wider viewing angles than the previous device, increased 5K resolution of 5120 x 2160 pixels, and a 21:9 aspect ratio. 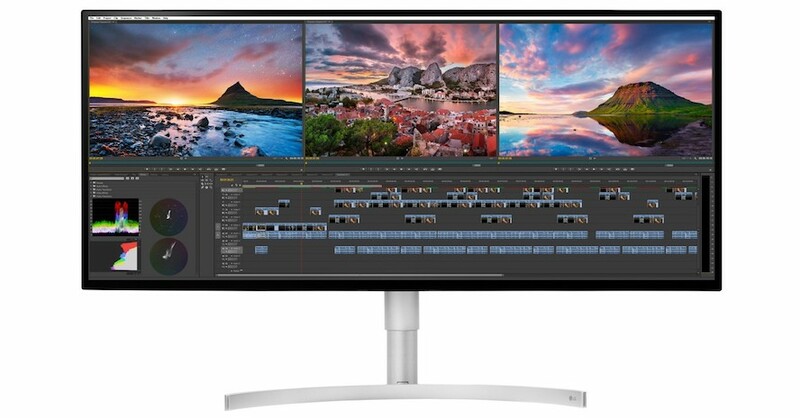 LG is aiming this monitor at customers who "extensively" multitask during their workflow, including video editors, photographers, and software and app developers. Just like the first monitor, the 34WK95U supports Nano IPS technology, HDR 600, and a Thunderbolt 3 port that can transmit 5K resolution images at 60Hz, along with data and power, through a TB3 cable connected to a compatible MacBook Pro. The third and final monitor (LG 34GK950G) is given the least amount of detail in LG's announcement, being described as the company's latest QHD gaming monitor. This one offers the same Nano IPS technology for premium picture quality when running games, as well as high-speed G-Sync technology. No other details about the 32GK950G monitor were given. CES will officially begin on January 7, 2018, so more information on the prices and launch dates of LG's monitors will be coming soon in the new year, along with many other new technology and product announcements. 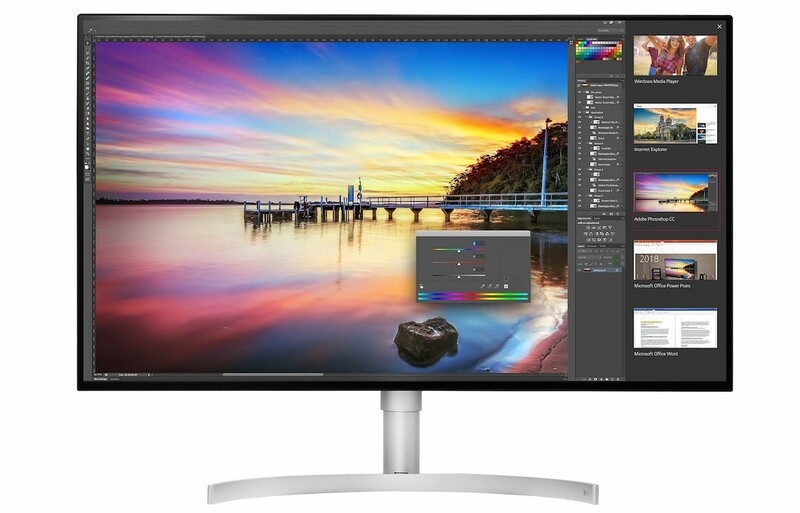 For more on LG's current monitors, check out MacRumors' reviews of the 27UD88, UltraFine 5K, and 38UC99 curved "UltraWide" displays. Purchasing as soon as they become available. Those complaining about lack of different ports on the new MBP just don't get this part. I can have power and everything else over a single cable. Means when I get home, plugin a single cable and now my monitor, power, RAID, ethernet, keyboard, and more are all connected. Just one cable. Makes things so nice and easy. Great pitch for rationalizing Apple's decision. The problem becomes when one takes that mobile computer on the road and needs to hook into just about anything at any other location that is not home. It's no longer "nice and easy with one cable." Instead, it's rough & complicated with dongles/adapters/etc. But I guess thinking like that makes me one of those people who just "don't get it." I do grasp the specific benefit you shared. Too bad that's not the only thing that people need to be able to do in terms of connecting a laptop to other hardware. I miss the added utility of common ports built in vs. needing dongles & adapters... even more so when the price of the laptops go up as the utility is jettisoned. Marketing spin doesn't make it any better either. So ultrawide 5k via Thunderbolt 3. Is it possible to dynamically split the display into multiple displays via software? I've been interested in ultrawide monitors, but from what I can tell to do multiple displays you typically need to have two cables running. Meaning you have to plug in another cable, then manually set up the split using the crappy monitor onscreen menu system. If I could just hit a keyboard shortcut and go from one wide desktop to two separate desktops (Over one cable), I'd be all in. I was always on a dual monitor setup but a few weeks ago got a dell u3818dw. It has been amazing!! The software I use for window management is called bettersnaptool. It’s extremely customizable, has keyboard shortcuts and windows-like side snap features. Another great and popular one is called magnet. These are available at the App Store and you’ll love them. Much better than apples built in split screen features. Let’s just say I’m so impressed with ultra wide especially when it comes to FCPX and Xcode and how much it has improved my workflow over 2 monitors that I’m secretly hoping and wishing that the Apple monitor is actually an ultrawide. Pretty sure TB3 is only in a specific USB-C format and even pc has no other format. The whole convenience thing is just inherited from the USB-C spec and you simply cannot use other cables to work with it. If this is just a complaint about how the MacBook pros only have usb c ports, this has been covered thousands of times and it’s done. It’s the future, it’s not going to change, Apple will not put old USB ports back in, nor will they put the cdrom back in, even if they did people will complain how they already bought hundreds of dollars worth of dongles (not sure where these people are buying these dongles). Let’s not waste time bringing it up again. And I’m not trying to be an a**. And sorry if I’m coming up as. Everyone’s complaints really are valid, but most of us have moved on, enjoy the benefits of USB-C, and simply tired of hearing the whining when the USB-C solution is working, had been working for a long time now. What are all these adaptors one needs to travel with? I travel a lot (million mile club). I carry along a Thunderbolt to HDMI and a USB-A adaptor. That's it. And nearly never need either. Most places have DisplayPort cables from their projectors which is the same connection as Thunderbolt so it just plugs right in. When traveling, rarely do you ever need to plug in other devices. You partially answer your own question there. I also need Ethernet at some locations. And most places I go don't have DisplayPort or are not sure, so then I- apparently like you- am having to bring along options just in case. And don't speak for me when traveling. When traveling, I DO need to plug into other devices. Just because you don't doesn't mean that you represent everyone. Just because your stops are more compatible doesn't mean all stops are compatible. The situation used to be that we could just throw a MB Pro in our bag and very likely be able to connect with about anything we might encounter. Now we can't. We used to be able to go light, knowing that just about any stop will likely have a cable we can just plug in and use. Now we can't. Maybe down the road, most companies, business hotels, etc will replace their technology with stuff that easily connects- and that will be great- but between here and there, it's a hassle that only some of us embrace (presumably) because whatever Apple decides to do must be rationalized as right. You yourself are carrying a couple of things you didn't have to carry before. And here you are trying to challenge me on the suggestion that I'd rather have an Apple laptop that doesn't require me- or you- to do that... like it used to be. If we step back in time when Apple built laptops with common ports, were you there griping about them building in so many ports, wishing they would cut it down to as little as just one port? Of course not, right? Why? Because Apple was right when they built laptops with a variety of common-use ports. And now Apple is right for building laptops without common-use ports. But I understand the rule: whatever Apple has for sale at any given time is the one and only right thing for everyone. If anyone chimes in "thinking different," let's just get after them for not loving it exactly as a corporation has decided to serve it up. I- like you- make it work by lugging along dongles, etc... but I don't like it better (between now and "the future")... nor do I feel I'm making some noble sacrifice to help Apple spur on "the future." I'm not even sure Apple believes that. Else, once again, new iPhones of which they will sell tens of millions of units would have embraced USB3C over proprietary Lightning. Get 100M+ iPhones out there this year with USB3C and other stuff will be more likely to accelerate the migration to USB3C too. It's completely absurd how big most monitors are today. I'm sorry, but you are a complete knob-head if you use a 32" monitor. What an utterly ridiculous statement. It’s nice that you live in an Apple commercial, apparently, but the real world is messier. Maybe in the future this stuff will all work (and these monitors look like a good first step) but it’s seriously going to take another year or two. Here’s hoping Apple doesn’t move to some all-new connector by then. Ha ha. Just kidding. They absolutely will. That’s what happened right about the time accessories caught up with thunderbolt 2, so I’m fully expecting it to happen again this time. Until you don’t have the right adapter. I have the LG 5K display that Apple supposedly collaborated on, and it was part of the initial batch with the shielding issues. LG damaged my display during the shielding fix (which left me without my monitor for two weeks), and their solution was for me to send the display in for repair again with the same timeframe. Their support is outsourced and horrible to work with – nobody understands anything beyond several scripts that they have in front of them, and they are powerless to do anything outside the very strict guidelines. I will not be buying another LG product and I can't wait to replace this display with an Apple one! Excellent, I've been holding off buying a 4k/5k display until I can also use it as a TB3 hub.